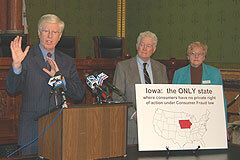 Iowa Attorney General Tom Miller says he hopes 2008 will be the year the legislature approves a bill to allow individual consumers to file fraud lawsuits against companies. Miller has pushed for the Consumer Rights Act several times before, but it’s always been rejected. He blames business interest pressure on legislators. "Let’s face it, the reason they’ve gotten their way for so long was because of their political power and their campaign contributions. Legislators have to put that aside and do what’s right for the public of this state," Miller said Thursday at a statehouse press conference. Miller says his office does not have the time to tackle every consumer fraud complaint and should follow the lead of the 49 other states that allow residents to file claims on their own. The proposal would also allow consumers that win their lawsuit to retrieve attorney fees from the defendant. Miller says that’s important because the cost of hiring an attorney can often times be more than the damages in question. State Representative Eric Palmer, a Democrat from Oskaloosa, has pre-filed the Consumer Rights Act legislation. "It’s embarrassing that there are 49 other states in this country that have done that," Palmer said. "They care enough about their most vulnerable citizens that they’ve passed a law like this. And we’re not going after business here, we’re going after the bad actors…business should not be afraid of this law." Bruce Koeppel, state director of AARP, says the consumer fraud law is his organization’s top priority for 2008. Koeppel said, "The question we want all Iowans to ask Iowa state leaders is, ‘why could this issue even be controversial in Iowa? What makes our state different from every other state in the country?’" John Gilliland is Vice President of Government Relations for The Iowa Association of Business and Industry. He says the proposed legislation is "too broad and vague." "We’ve tried to work with the Attorney General to craft a law that actually will get rid of bad actors in Iowa and at the same time, protect good companies," Gilliland said. He says passing private right of action in Iowa could lead to frivolous lawsuits. "There’s been states that have scaled back their consumer protection acts because of abuse and frivolous suits," Gilliland told Radio Iowa. Representative Palmer says he has faith that "suits without merit" will be rejected by Iowa courts.